Many people prefer to build a home from scratch. That way you can decide on every single architectural detail from the ground up. It's a lot of work and takes much dedication, time and not least of all perseverance. 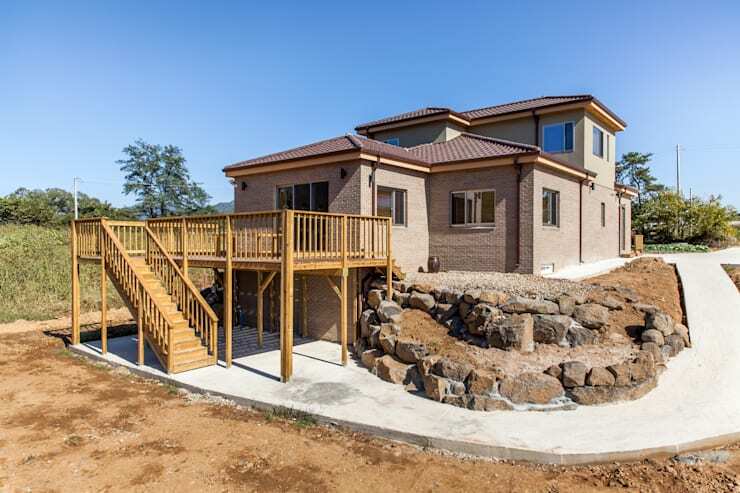 This newly built modern home has a distinct and traditional Japanese air about it. 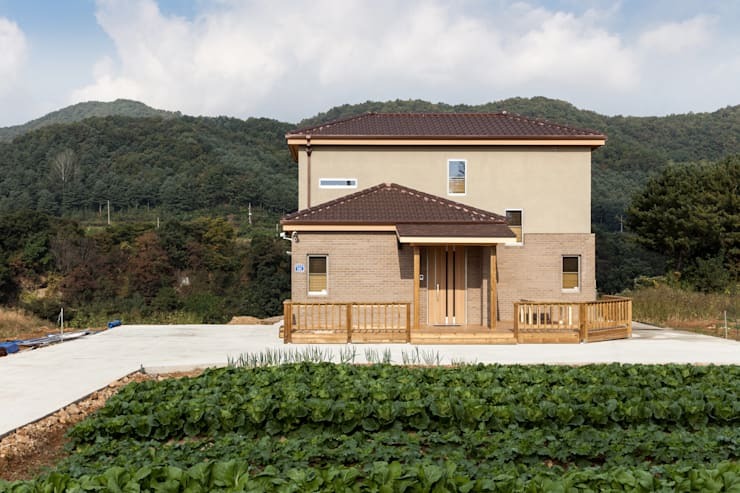 At the same time, the architect has a strong vision in creating a practical unit, logical floor plan and design with an emphasis on space and light. 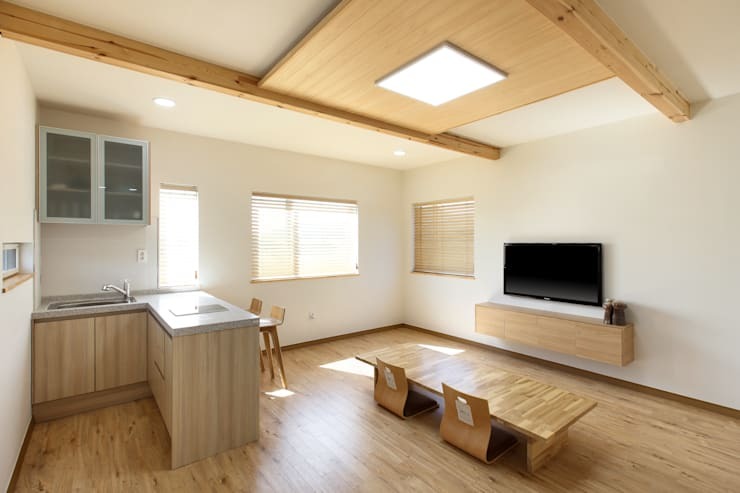 The entire house is flooded with sunlight by the key positioning and dimensions of its windows. There is a definite intention to make the house clean and simple. In many ways, it is reminiscent of the i-phone philosophy, where ease of use and minimalistic principles are quite obviously employed. Intrigued to see inside? Then read on! You can see from this photo how the architect has employed the use of many windows to filter light. There are windows on every wall and the balcony has been given sliding doors as seen in Japan and many oriental house designs. 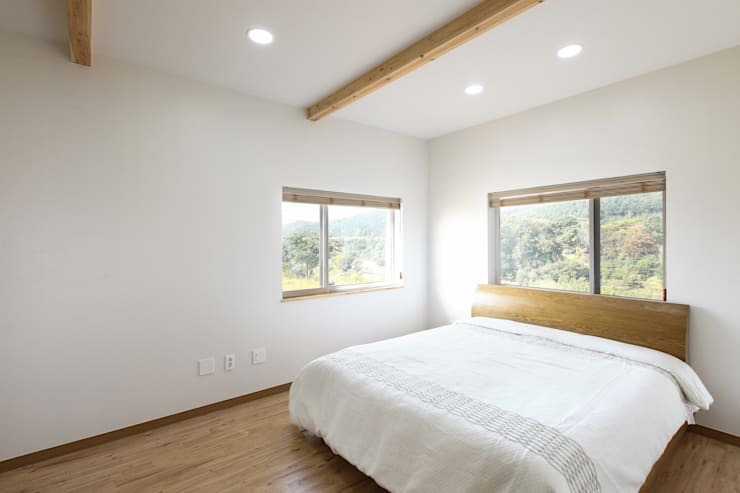 This is a simple way to illuminate the room, and at the same time, promote a wonderful feeling of space as we look out to the surrounding fields or daydream into the clouds. The simple wooden balcony and stairway lead down into the garden area and also offer a place to keep items such as bikes for easy access. An example of the irregular yet effective placement of windows in an expression of logic and diagonals! Note the curiously thin window on the upper left of this main outside wall. The architects' use of wood extends all the way around this home, almost as a way of keeping everything neatly within a certain natural boundary. It is a sign of the neatness and practicality of the general design which we will explore in more detail as we journey through the house. The concept of the sliding door gives extra space to the room by eliminating outward or inward swing. Because of this we can use the corners of the room in interior decoration. 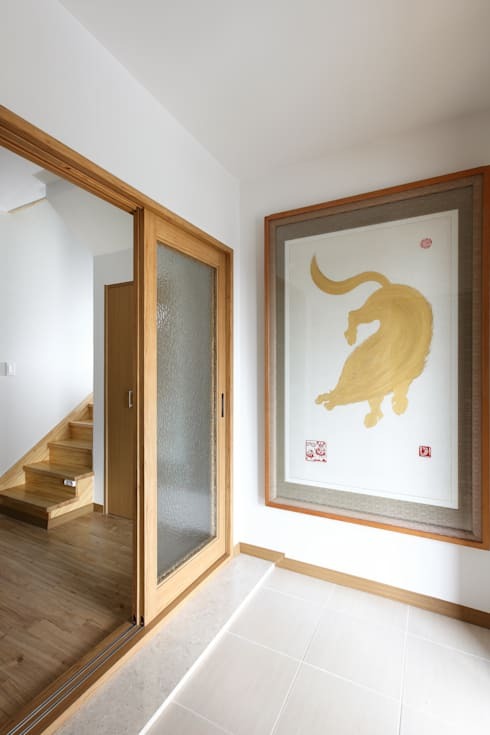 In this particular example, a traditional Japanese semi-fictional animal is hung close to the wall door wall. In European homes we might need to move this painting further into the room. The frame of the picture is of a similar type to the frame of the doorway promoting a certain consistency which is an ongoing feature of this dwelling. 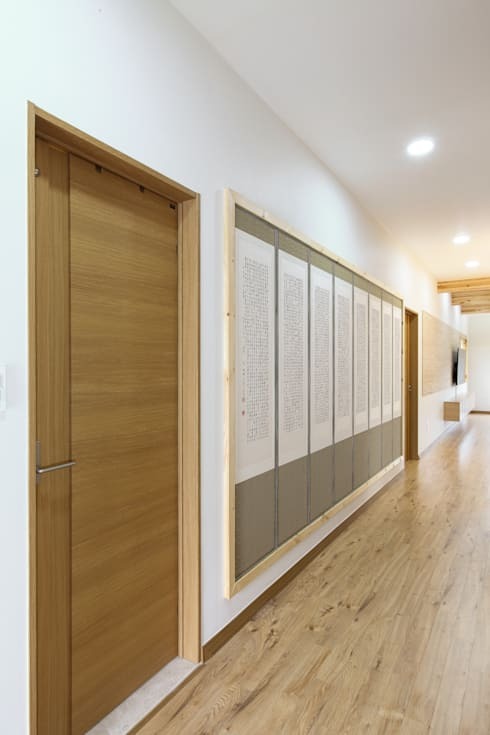 Although this hallway initially strikes us as being thoroughly Ikea-esque modern, it does elicit a certain longing for the feudal past. 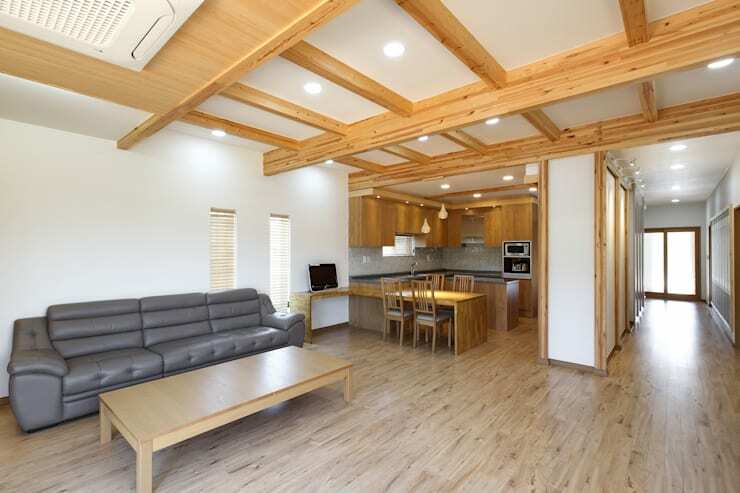 Possibly, you can see a certain similarity in the Japanese scrolls hanging on the left wall and in the old bamboo partition walls used in the ancient times of Shoguns and Samurai. Whereas here we see wooden flooring, in the old days there would have been matting not unlike those still used in the dojo or Judo training centres. Logical, precise, practical and functional. The key elements that make up modern Japanese thinking are clearly displayed in this small bathroom. Everything is accessible and within easy reach. 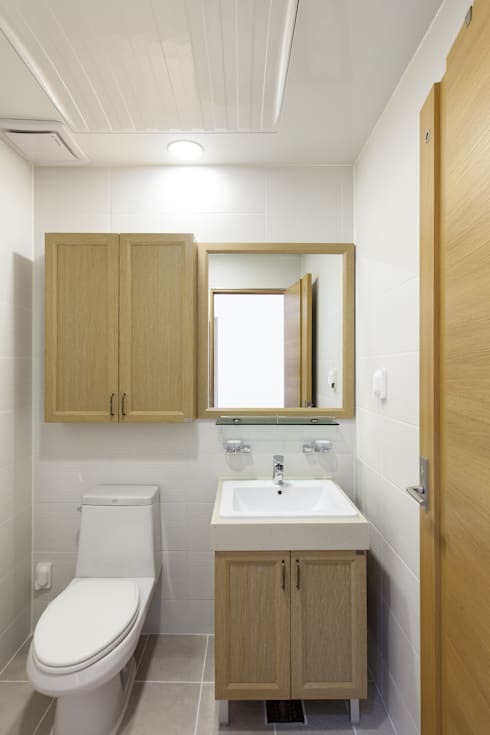 The general flavour of decor is maintained, as shown by the light coloured wooden cabinets against the pure white of the walls, toilet and sink. Here we have the idea of space with light, and the continuation and importance of wood as a complement to nature. The main feature here is obviously the grand ladder-style beams across the ceiling of this open-plan kitchen and living room. We have the first change in colour scheme, with the dark counter in the kitchen area and a darker grey couch giving this area more character. People watch TV the world over. But in keeping with tradition, these 'chairs' are without legs, and the occupants will be cross-legged or kneeling as they catch up on their favourite shows or the news of the day. Can you see yourself living in a house like this?